Here’s a simple something worth a lookyloo. Washi Tape. It’s my thing. 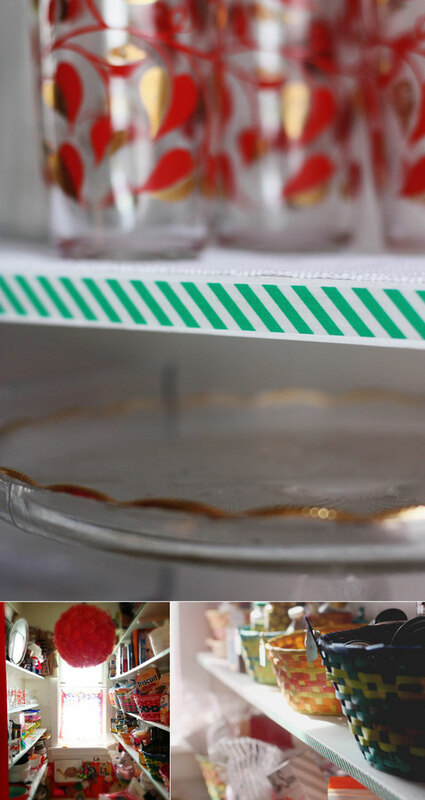 I use washi tape on all sorts of stuff around the house. Last weekend I decided to use it on the edges of some temporary utility shelves in my living room. Eventually I would like to replace the set-up with a breakfront cabinet, but in the meantime, washi tape does a good job of elevating the shelves to something more substantial than some rando melamine planks left in basement. Decided I liked the living room set-up so much, I took it to the pantry. …and know everyone knows my passion for Triscuits and Easter baskets. The tape I used in the living room was new and super sticky, but the stuff in the pantry was a little older and dried out, so I dabbed some white glue here and there just to make sure it stays in place. 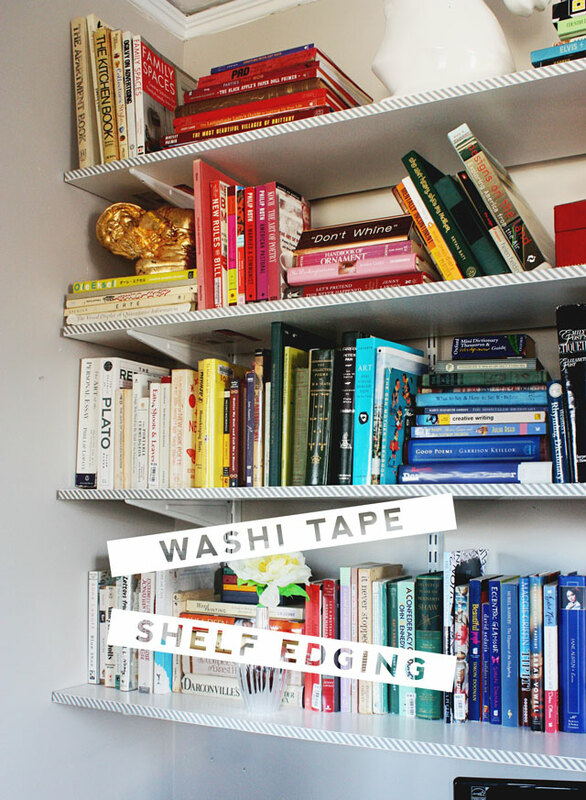 I don’t plan on changing it anytime soon, but if I did, I could easily run a layer of removable tape between the shelf and the washi tape just to be safe. Yeah, washi tape. It’s my jam. 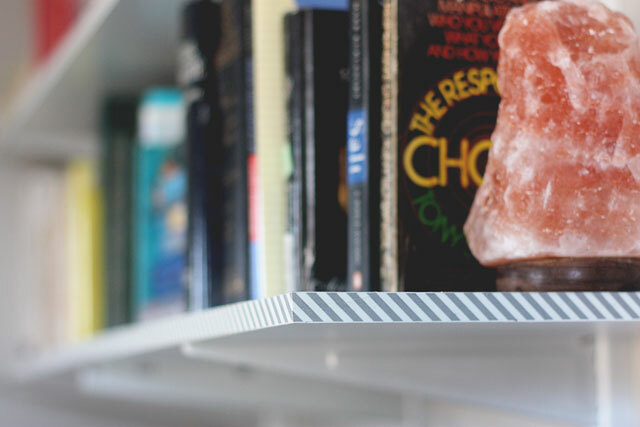 PS Cool new website: Washi Tape Crafts. Oodles of ideas on other nifty stuff to make. I am a new addict too! This stuff is addictive. How simple and chic! Like that you used a geometric for these, I think it’s just the right thing. I thought about flowers. I’m not that nice of a person. STripes suit me best! This is awesome! Thanks for the idea. I love the look. Actually this is the most efficient way I have ever organized them — each shelf has a general sub-collection and then they run light to dark, left to right. By alternating vertical and horizontal clumps, it’s easy to add along the way or remove without messing up the aesthetics. After six months, this way looks much better than the much larger bookshelf in the second bedroom which was set up the old-fashioned way. I’m keeping it! No, no, I know what you mean about contrived. Sometimes I see pretty pictures of WALL SIZED rainbow bookshelves and you just know a stylist set it up for the photoshoot and the homeowners had to spend some Saturday putting it back the messy and less-pretty way it was before. It ranks right up there with pictures of pristine kitchens with a random bunch of lemons half-cut on a cutting board. Who cuts six lemons then says “Gosh, let me get my photo gear out and take a picture.”? Nobody. 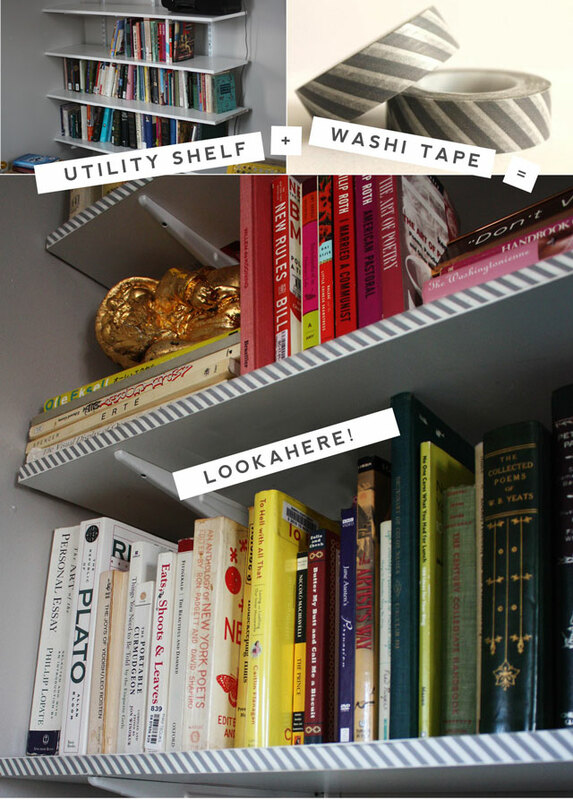 Ok – here’s the real question – what are those fabulous gold/red/heart glasses on your shelves? I’m thinking they might be vintage but if not where are they from? Salvation Army, baby. $2 For the whole set!